Dr. Lough Phillip Sigler (1884-1951) was an optometrist who moved to Dallas from Denton County in 1908; the following year he opened a jewelry and watch store inside an Old East Dallas pharmacy at 4301 Elm Street, at the northeast corner of Elm and North Peak, eventually expanding into the adjoining storefront. In 1930 he moved across the street into a brand new building at the southeast corner of Peak and Elm: 132 N. Peak, seen in the photo above. 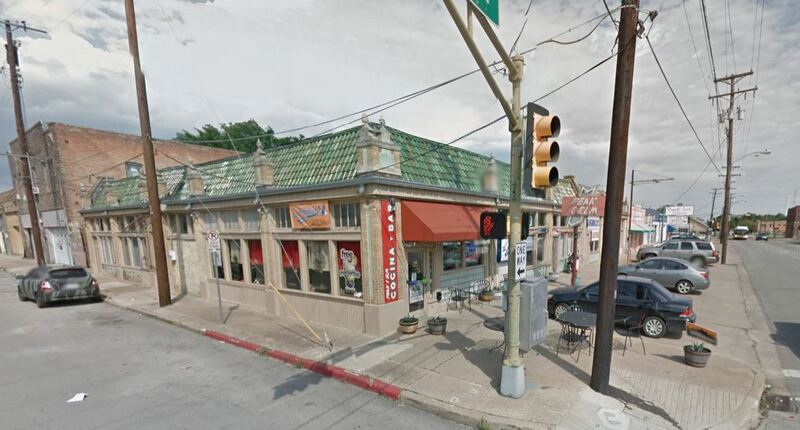 This type of neighborhood retail strip of shops and cafes was a common site throughout the city, and there are several still standing, most of which I’ve seen in Old East Dallas and Oak Cliff. I love these strips, and, thankfully, the one seen in the photo still stands. 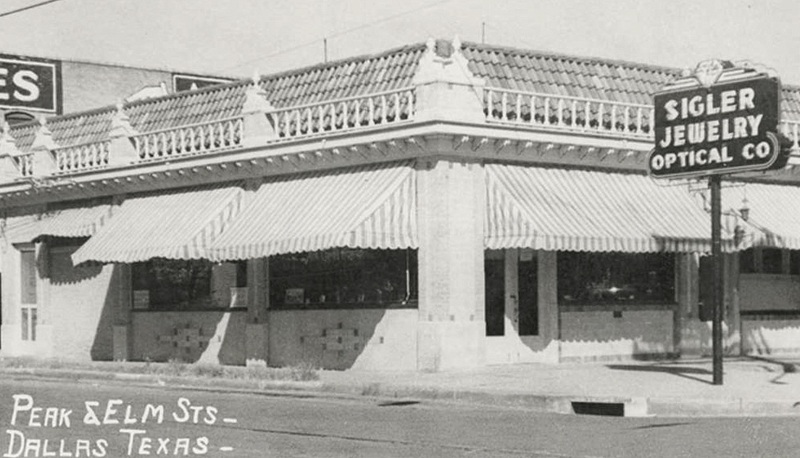 The jewelry company founded by Dr. Sigler had an amazingly long life: the store opened at Peak and Elm in about 1910 (at the northeast corner) and remained in business (at the southeast corner) until well into the 1970s. The business which currently stands at 132 N. Peak is a very charming Mexican restaurant called Peak & Elm Cocina y Bar (check it out!). Top image — “Peak & Elm Sts.” — is from a real photo postcard in the George W. Cook Dallas/Texas Image collection, DeGolyer Library, Central University Libraries, Southern Methodist University; more information on this photo can be found here. If I had to guess the date of the image, I’d guess around 1930 when Sigler moved into the new location. The strip appears to have been built in 1929, with its first tenants showing up in the 1930 city directory. See it today on Google Street View, here. 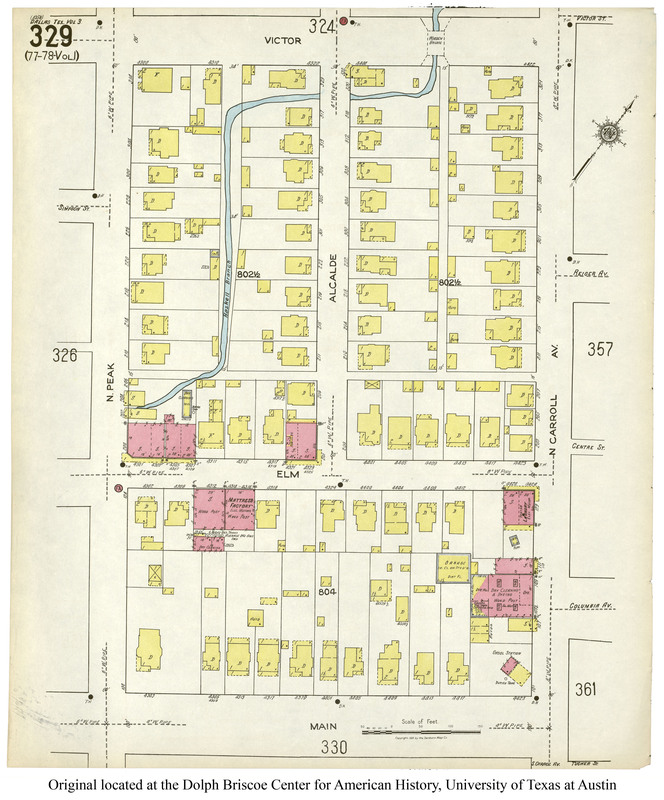 Just as an interesting historical note, directly across Peak from Sigler’s jewelry store were car barns and machine shops for some of the city’s electric railway streetcars — they can be seen in a 1922 Sanborn map here. Those blocks are currently occupied by Dallas Area Rapid Transit facilities. 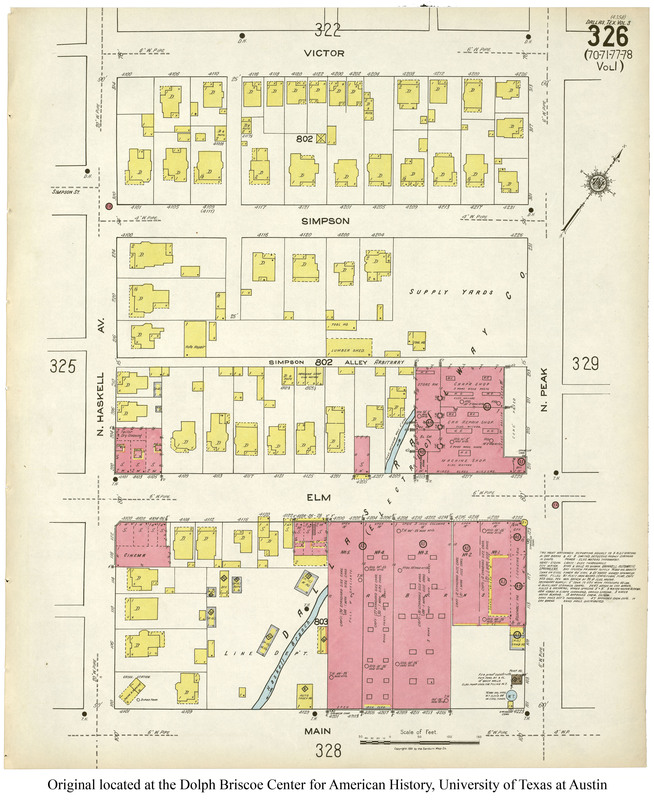 The 1922 map showing blocks occupied by Mr. Sigler’s store(s) is here (his first location at 4301-03 Elm is seen, but the building which housed his later store at 132 N. Peak is not seen as it would not be built for another seven or eight years). Glad to see the building is still in operation!! !